SUMMARY: Despite early indicators of success on the management front, obesity is still tied to an estimated $117 billion in healthcare costs. 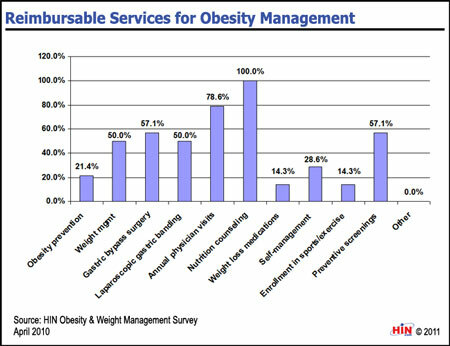 We wanted to see which obesity and weight management services are reimbursable for adult populations. 2011 Benchmarks in Population Health Management: What's Working in Coaching, Weight Control and Tobacco Cessation takes a comprehensive look at industry activity in health coaching as a whole, then drills down to obesity management and tobacco cessation program data. The disease management data contained in this benchmarks report are derived from three separate surveys conducted in 2010 by the Healthcare Intelligence Network, to which a total of 425 organizations responded. 2011 Benchmarks in Population Health Management: What's Working in Coaching, Weight Control and Tobacco Cessation is available from the Healthcare Intelligence Network for $179 by visiting our Online Bookstore or by calling toll-free (888) 446-3530.